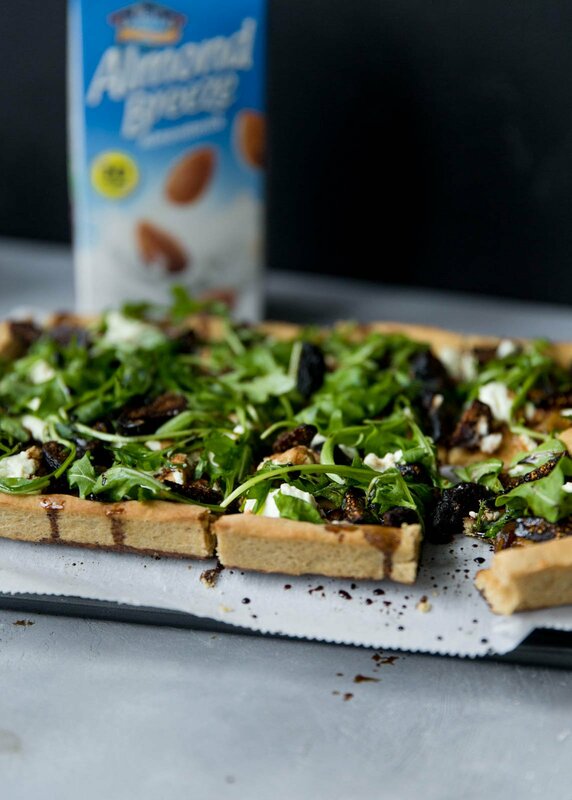 Amazing fig and goat cheese pizza with caramelized onion, goat cheese and an easy homemade 100% whole wheat pizza dough made in partnership with Almond Breeze. Seriously sooooo good. Well Monday, we meet again. After a weekend of binge watching 13 Reasons Why on Netflix and catching up on all things Healthy Glow. Co, I’m feeling a little bit better about life in general. Sometimes a little down time is all you need. As I hurl myself into my late twenties, I am reminded how incredibly important it is to find time for self care. And sometimes that involves chilling out, taking care of your mind body and soul, shutting out social media and work, and eating a little ‘za with the ones you love. So in honor of a little self care love, I offer you this beautiful, ridiculous delicious and good looking fig and goat cheese pizza. OH MY GOODNESS. To be honest, I’ve been in love with this pizza combo for years. 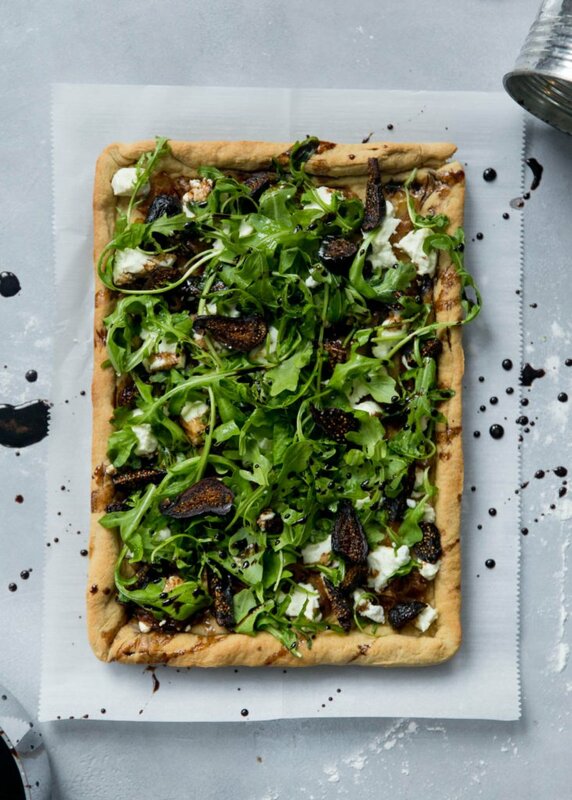 There’s something addicting when you throw tangy arugula, creamy goat cheese, sweet textured figs and luscious caramelized onions on a pizza. And yes, I did just call caramelized onions luscious. Frankly, they just are. But wanna know what makes this pizza truly special? The fact that it’s made with 100% whole wheat pizza dough. Yep that’s right, you get to try making your own pizza dough. And guys, trust me when I say it’s crazy good. 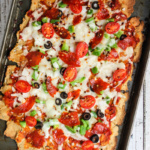 Pan size is very important if you want to make the sheet pan pizza shown in this recipe. Here are the pans that I normally use when making this recipe. 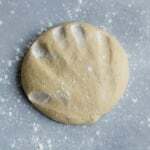 Whole wheat pastry flour. This is still 100% whole wheat flour, but just lighter and fluffier than regular whole wheat flour. This ingredient is a must in this recipe, that’s for sure. Alternatively, you could try the recipe with half whole wheat flour and half regular all purpose flour. Up to you. Unsweetened Almond Breeze Almondmilk. This adds a nice moisture to the dough compared to just using flour. Game changer! Yeast. Helps the dough to rise. Honey. Helps activate the yeast and gives the dough just the slightest sweetness. Yellow Cornmeal. I don’t know why but a touch of cornmeal adds such a nice chewy to the dough like you wouldn’t believe. Finally, we arrive at the toppings. Now I’m a firm believer that you can always switch it up and do you own toppings. However, I have to admit that I have a small spot in my heart for this combination, which is why I dare you to try it and not fall in love. It’s summery, savory and sweet. 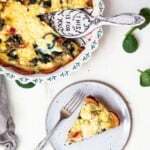 So whether you’re looking for your next date night meal, a fun way to switch up your weeknight dinner plans or if you just need some serious self care, make this pizza and all will be good again. Enjoy! xo. Don’t forget to tag #ambitiouskitchen on Instagram or leave a comment below if you make this recipe. 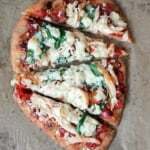 Amazing fig and goat cheese pizza with caramelized onion, goat cheese and an easy homemade 100% whole wheat pizza dough! You'll love how flavorful this pizza is. Next place dough in a medium bowl lightly oiled with olive oil. Cover with plastic wrap and a towel and let rise for 1 hour or until dough has doubled in size. It’s better if it’s in a slightly warm place. While the dough is rising, you can make the caramelized onions: place olive oil a small saucepan over medium heat, add onion slices, spread the onions evenly out in the pan and cook, stirring occasionally. Check onions every 10-15 minutes until they have completely caramelized and turned golden in color. This usually takes 20-30 minutes total. After dough has doubled, preheat oven to 450 degrees F. Add parchment paper to a large baking sheet, or grease with nonstick cooking spray. 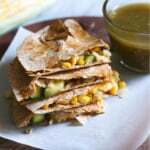 Grease 11x9 or 8x12 inch baking sheet generously with olive oil or nonstick cooking spray. Sprinkle with a little cornmeal. 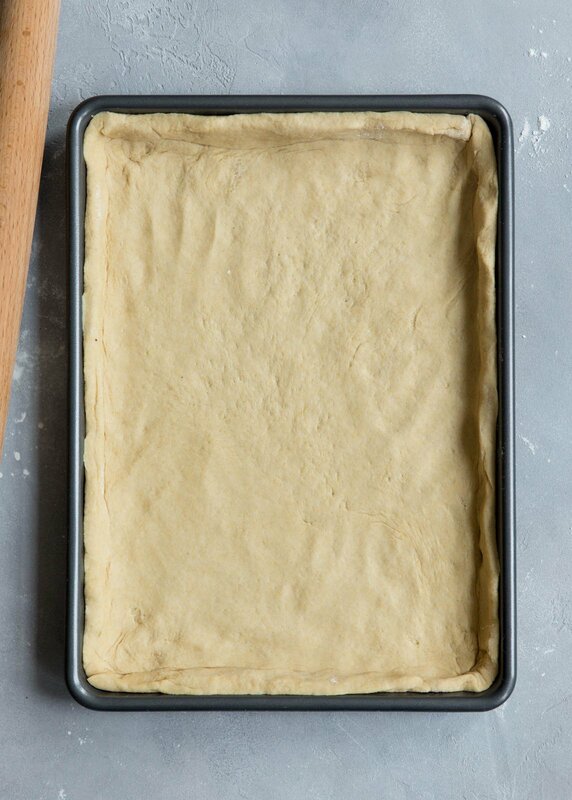 Dump dough into an oil rimmed baking sheet, and stretch dough out towards the edges. Cover with plastic wrap and let it sit for another 20 minutes. It’s okay if it doesn’t stretch all the way to the edges right way, it just needs a little time to rest. Make the balsamic reduction: Add balsamic vinegar to a small pot and place over low heat. Allow it to simmer for 10-15 minutes until reduced by half, then set aside until you are ready to enjoy on the pizza. After dough rests, pull again towards the edges of the pan so that it forms a nice small crust. Brush crust with a little olive oil. Bake for 10-15 minutes, until pizza is slightly golden brown on the crust and bottom. 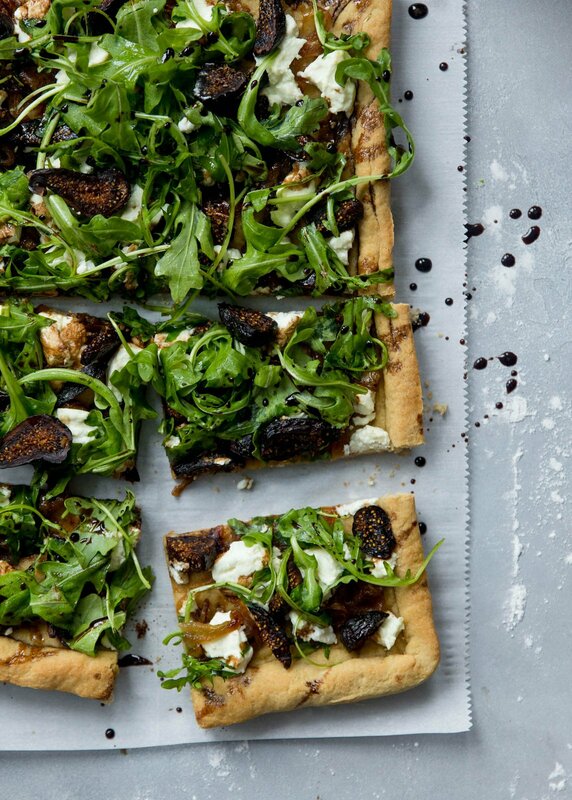 Brush dough or drizzle with just a little bit of olive oil, spread caramelized onions over the pizza, along with the figs and goat cheese. Bake for 5 more minutes or until onions and figs are warmed through. 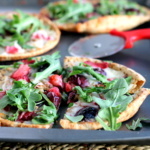 Remove pizza from oven and top with arugula and drizzle with balsamic reduction. Cut into 10-12 squares and enjoy! This post is in partnership with Almond Breeze Almondmilk. Thanks for supporting AK and the brands that help make this site possible! 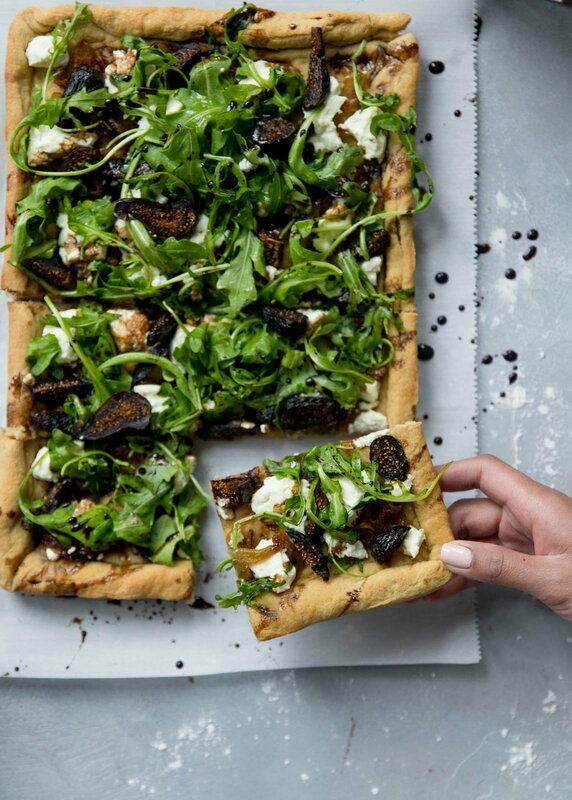 24 Responses to "Caramelized Onion, Fig & Goat Cheese Pizza with Arugula + video"
Also, I want to watch 13 Reasons Why but I’m scared it’s going to be sad! Maybe I should try it, and perhaps have a little binge watching session of my own. I tend to go overboard when making my own pizza instead of picking a few strategically delicious toppings, so this is helpful! I mean…figs and caramelized onions- done! whoa, would have never thought to use almond milk in pizza dough! sounds interesting and definitely something to check out. the toppings sounds classic and so good; anything with caramelized onions and i’m there! The figs are a new topping for me, but combined with the other ingredients they sound amazing!! I agree with Heather and Lindsay- I caramelize onions at least once a week. Have you experimented with a gluten free version? Baking now; I can’t wait to try it. I’m solo tonight, so it’s a perfect time to make this. My significang other and son don’t care for the toppings on this pizza. That pizza looks great! I need to experiment more with adding things like the balsamic reduction to my pizza. can i use regular milk? Can’t rave enough about this recipe. I used fresh figs instead of dried since they’re in season right now and absolutely loved. 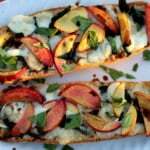 Now I have a go-to pizza crust recipe even though these toppings were SO GOOD! WOW THIS WAS AMAZING!!!! I made four pizzas for my pizza crazy family plus two guests and I wish there had been more so I could have leftovers for lunch. It was so, so good! Love it!! So glad you loved this one!